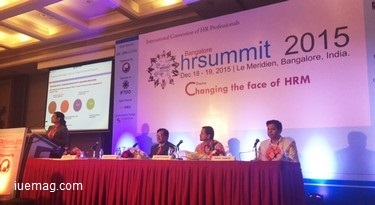 Bangalore HR Summit continued to present innovative thoughts and ideas to the HR professionals who were the delegates of the event and continued to deliver more networking opportunities on the second day of the summit as well. Read on! As the HR Summit proceeded with its second day of the event, exchange of knowledge and information grew as the interest of the delegates to learn had increased. You could find the summary of the happenings of the first day of the event at http://www.iuemag.com/december2015/sf/changing-the-face-of-hrm.php. Stalls were set up for the promotion of products of the sponsors including peopleworks, Manipal University, Central Test, Flipick. The first technical session had Mr. Siddharth SN, VP-HR of sparr as the moderator. Mr. Lancelot Cutinha, Head HR at Mahindra Lifespaces discussed on major imperatives to establish a performance-driven culture in start-up organizations. 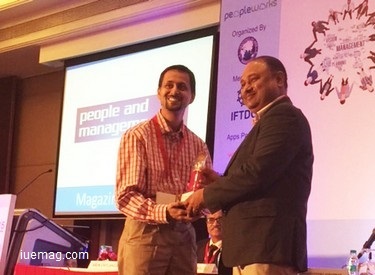 The concept of the top factors that drive the employee engagement in an organization and walking the talk on employing engagement was discussed by Mr. Prakash Hegde, Director-HCM Practice, QAI Global services. Mr. Anirvan Mukherjee, Director HR at CGI, created a thoughtful process to leverage talent for competitive advantage. The next session technical session was moderated by Dr. Amrita Saxena, Global Head-Learning & OD at 7 Innovation labs. Dr. Amrita instilled the thoughts of what it means to be a leader in an organization more than just playing one’s role in the senior management of the company. She prepared the stage for the panelists who would discuss, with agendas related to the same. Mr. Amitabh Akhauri, Senior Vice President HR, Jindal stainless Ltd, presented his thoughts on driving business and the leadership pipeline through talent mobility. Mr. Gaurav Saini, Head L&D, Happiest Minds Technologies and Ms. Ruchira Bhardwaja, Chief HR officer at Future Generali India life insurance Co Ltd, discussed on leadership development of every employee within an organization. The sessions were followed by a lunch break along with networking of the delegates, after which there were research papers presented by some of the phenomenal individuals. Mr. Vishal Thakur AVP-HR, Tata capital financial services Ltd, Ms. Shruti Patra from JK industries and Mr. Achintya Bakre from Infosys Ltd presented their papers on ‘A study of spirituality at work place and its contribution in leadership effectiveness and organizational results’, ‘Ready now: A study of frontline leadership framework’, ‘Global trends in learning’ respectively. Each of the research papers were innovative, creative and were unique in their own ways, along with factual information. The valedictory session began with Mr. Arun Chitlangia, who had to present the summary of the HR Summit proceedings. Mr. Arun who is the CEO at training tree involved the whole of the crowd in summarizing the summit proceedings, through an activity where the delegates where parted into eight groups and each of the groups were made to summarize one of the technical sessions of the event. This way, the activity not only created an environment for the delegates to brainstorm the happenings of the event, but also gave an opportunity for the participants to network and learn from each other. The activity of summarizing the summit was followed by valedictory address by Dr. Sebi Chacko, CHRO, Strides Arco Labs, who instantiated the thought of implementing the lessons learnt from the event once the participants got back to their organizations. The research papers were assessed, to reward the best presentation of all and Mr. Achintya Bakre, who presented his paper on 'Global trends in learning 'was awarded for the same. The event left the delegates with a feeling of passion, responsibility, dedication, determination and passion to perform with an increased motivation and become the reason to create improved productivity in their organizations once they got back to work. As the crowd dispersed, the organizers continued to discuss on the happenings of the event and on how better the summit could be organized in the coming times. Any facts, figures or references stated here are made by the author & don't reflect the endorsement of iU at all times unless otherwise drafted by official staff at iU. This article was first published here on 22nd December 2015.